milk peda recipe | doodh peda recipe | easy milk peda from milk powder described with photo recipes. 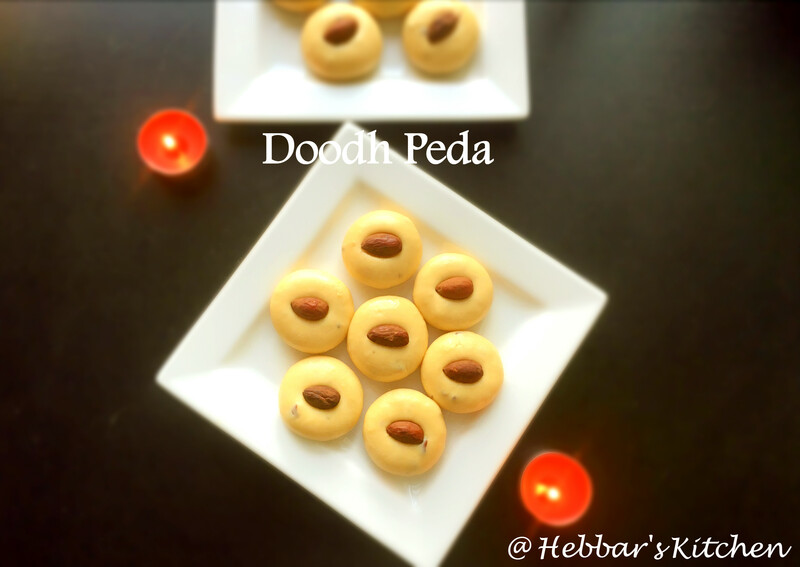 doodh peda is a favorite indian sweet prepared during festival season. 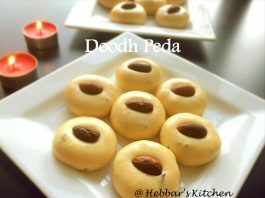 milk peda recipe | doodh peda recipe | easy milk peda from milk powder with step by step photo recipe. doodh peda is traditionally prepared from khoa or khoya and flour. whereas, this instant milk peda is prepared from milk powder with condensed milk. there are several variants to peda like mathura peda, dharwad peda. however doodh peda is the most popular one. doodh peda has always been a favorite sweet in my house. we usually prepare this sweet during the festival season of diwali, navaratri or ganesh chauthi. however, one my friend gave me the idea of preparing milk peda from milk powder for this ganesh chaturthi. i was really impressed with the idea and trust me it was so easy to prepare. moreover, i have not used any extra suger apart from the condensed milk. according to wiki, peda originated from mathura, uttarpradesh. peda or especially, milk peda is still considered as sweet delicacy of uttar pradesh. in mathura, peda’s are served as a prasad to gods. however, from nutrition perspective, it has very less carbohydrates and protein. but very high in fat, so be responsible while consuming milk peda’s. check my collection of sweet or desert recipes. especially, carrot halwa, kayi holige, besan laddo, chocolate mug cake, mango rasayana, gulab jamun. also i have posted laddu recipes like rava laddo, dry fruit laddo, and instant jalebi recipe. finely chop few almonds and keep it aside. also powder the cardamom before making milk pedas. now switch on the flame and keep stirring on a low flame. add cardamom powder and keep on stirring. keep cooking until it starts to leave the sides of the pan. add chopped almonds or any dry fruits of your choice. once it starts leaving the sides of the pan, add ghee and give a quick mix. keep on cooking until a thick mass is formed. to test, take a small portion and you should be able to form a ball. switch off the flame and cool it down for 5 mins. meanwhile, grease your hands with ghee. take a small lemon sized portion and start making a ball, slightly flatten it. make a small dent in the center, place the almond and arrange in a clean plate. your milk peda is ready. store in airtight container. it stays fresh for about 10-15 days. extra sugar is not required as condensed milk has sufficient sugar. but if you have sweet tooth, add as in required. optionally, add finely chopped tuti fruity’s to make it more tasty and colorful. do not forget to grease your hands with ghee or oil while preparing pedas. the milk pedas will be chewy while shaping them. but after an hour you will get the perfect texture and taste. refrigerate for longer shelf life. I tried this recipe now and it’s tasting yummy, just like in mithai shop! overcooking peda makes it chewy..
Hi.. I made this recipe today.. so very delicious.. wow.. homemade peda.. definitely the tastiest.. your recipies are so wonderful.. easy to follow.. The dishes we prepare at home following your recipe steps will​ look exactly like the pics you post.. too good.. Keep up your great work.. Thank you..
Hi sis. I have tried your recipe yesterday to make milk peda. It’s so delicious. I did use milk powder mix with hot water, result so tasty. But as per your advice mention after an hour it will good texttexture and shape. But mine take a whole night to get good texture. But its really tasty. My husband really love it. My sis in law ask me to do for her. I want to know which is the milk powder you used for peda. I stay in US and have no idea on which milk powder to use. I have got one doubt with peda recipe..